When we had Sophia, I'll have to say, I think we hit the jackpot with her. She was a pretty easy sleeper, we didn't have to put "pretties" up and she just wasn't the kid that you had to constantly run after diverting disasters. She still isn't that kid. Enter baby number 2- Saidey- or as we like to call her- the kid that eats anything- to the crumb on the floor to the other ummentionables on any floor at any given time. Saidey is also the kid who knocked over a tall vase that had been sitting by the fireplace, quite intact and pretty for a good three years or so. So it shouldn't be such a surprise that we have had to do a little extra baby proofing with this one. Yet, we still had managed to juuuust squeak by without doing anything to our kitchen or bathroom cupboards. Most of our "no no's" are high up and non accessible so most things that are reachable in the kitchen are Tupperware containers, that sort of thing. 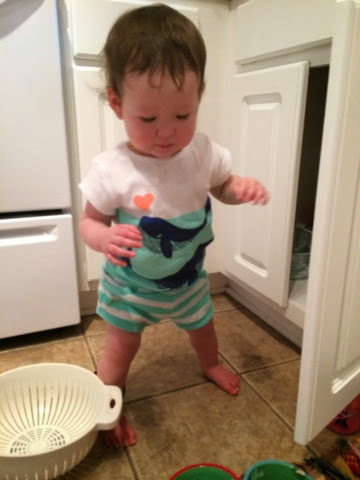 In the last week or so, though she has become fascinated with opening the kitchen cupboards and taking out our dishwasher packs. I have just taken them away and redirected and it hadn't really been a problem but Will did mention something about putting a device on the cupboard not even a week ago. After a fun filled day at the zoo, I was busily working away in the kitchen making dinner. Saidey was playing in the kitchen and had opened the cupboard under the sink, taking out two dish washing packets. Now, another thing that happens when you have two children, is that you're a little more laid back and things don't alert you as much as maybe they should. (Or maybe that's just my problem) I thought, oh man Saidey has those darn things again.. I better get those.. Oh the water is boiling! I'll get them from her after I get the noodles in. 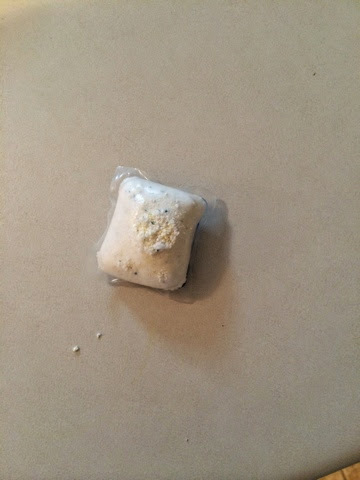 When I turned back to her to take them away, I noticed a small hole on the powder side of one of the packets. I picked her up and said yucky Saidey!! And then proceeded to catch her vomit. That's another thing that happens in motherhood- you do things you just never thought were possible. After that little episode I panicked a little. I checked out the packet and figured she must have ingested at least a little bit and contacted poison control. I felt quite stupid and embarrassed to admit to the woman on the other line that my daughter ate a dish washing pack. She was very nice though and I didn't detect an ounce of "where the heck were you?!" in her voice. In all, we have survived the cascade dishwasher pack adventure and now we can add to Saidey's colorful first year of life- the day she ate dishwasher powder and lived to tell the story. It is also the day that I apologize to the moms I have judged for when their curious tots have ate dirt or dumped an entire bottle of lotion on the carpet. The soap eater 15 minutes later.. in another cupboard.